This is a letter from a darling student of mine Ryan. We have become quite good frineds since he found me because of the video I did about organizing DVDs. Ryan has TONS of them and really had a hard time getting rid of VHS tapes. He still loves them, but has found it easier to let go of them, and even though I am always yelling at him (so to speak) about keeping those DINOSAURS, he still loves me. Well, I share his video today. Hope you enjoy it. I am Ryan and I have tons of Blu-ray films, DVDs and VHS tapes. I don’t have a lot of space to store my movies. 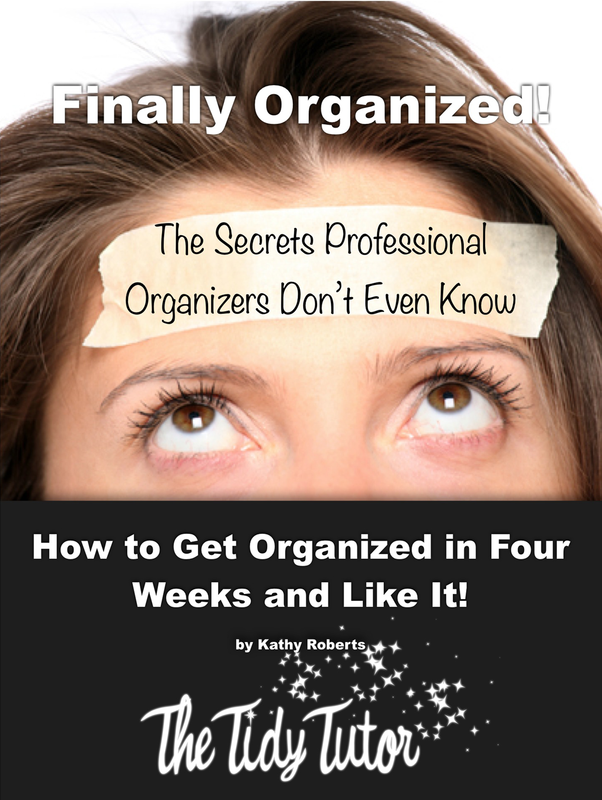 A few months ago, when I looked up online and YouTube to see how people organize movies, I found a lady named Kathy Roberts and she is the tidy tutor. When Kathy introduced the idea of getting rid of VHS tapes and the covers to DVD’s I thought she was crazy, but after realizing that there were many VHS tapes that I already owned on DVD and we don’t watch so many VHS tapes anymore as a family, that I think it’s time to get rid of them (donate them) or “throw them out”. A lot of these tapes will be donated to a children’s hospital for sick patients. One thing I have been doing is that the stuff people do donate like DVDs or some VHS tapes I pick them up considering what the movies are , if I don’t like the tape or DVD I will A) donate it to another place or B) throw it out or keep the case for something else. I do have tons of shoe boxes filled with DVDs and 1 ½ VHS tapes stored under our DVD player in our guest room (show in video). Then I have a roller cabinet file that is also filled with VHS tapes( show in video). I also have by the sofa (which will be shown in the video) VHS tapes stacked on top of each other. I do have a woven basket filled with all of my holiday movies (which will be shown in video). My mom has been saying since December of 2012 that she wanted to go thru all of our Tupperware under a cabinet. We had tons of glass jars, Tupperware’s, and cutting boards and lots and lots of water bottles. After de-cluttering everything my mom and I went through everything together. A lot of it went into the recycling bin and the stuff we kept we organized and put back under the cabinets. Just recently my mom did a quick project, she got all the cutting boards that could stand up and put it with the pans that also stand by our dishwater. (to dark to take a photo). Well I hope you enjoyed this video, Back to you Kathy.